Am I the only one that dreams about food while sleeping and has to make it while awake or the craving doesn’t go away? Anyone…Anyone? My friend Jay Diamond is going to hate that I’m outing him publicly about this, but whatever. 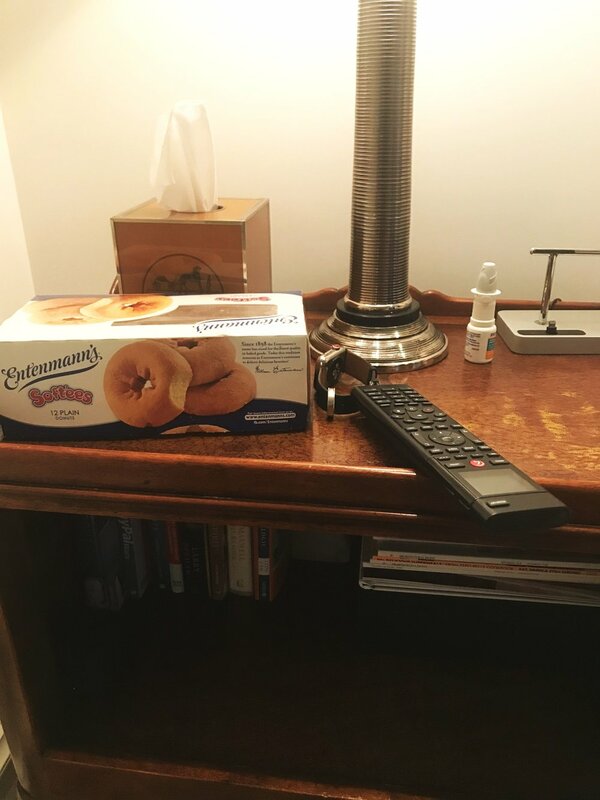 Jay has a love of Entenmann’s baked good; Namely their boxed donuts. This could solely be based on that these fresh, delicious, and tender pastries can be easily hidden in a desk drawer (or nightstand), or it could be that they may be conveniently ordered (in bulk) from Amazon. That love of Entenmann’s was passed to me (Not sure how he did it, but he did) in the form of the famously delicious and delicate Entenmann’s Crumb Cake. So, last night I had a dream that Jay and I along with his family ,Joe and their daughter Lilly, were on the lake laughing and talking… enjoying something from the famous blue and white Entenmann’s box. I thought it was crumb cake, but Jay had powdered sugar around his mouth which I read as being from the Entenmann’s powdered donuts that Jay loves so well. My only thought while dreaming was that I was glad he was not eating my crumb cake and that I was never going to tell him that he had powdered sugar all over his face … as Donatella Versace was making her way down to where we were to say hi. Yes, random, I know. From the home of Jay Diamond and Joe Nielsen…complete with nasal spray and tissue. So today I needed to make a crumb cake. Yes running to my local grocer to pick up a box of Entenmann’s Crumb Cake would have been easier, but that’s not what I do. I order them online through Amazon. Seriously this recipe of mine is one of my favorite cakes and easily made. The trouble is that it is incredibly tender and delicious and quickly consumed in its entirety in one sitting. The Entenmann’s crumb cakes you must physically open up the packages, and well… that’s more effort than one cake/one fork. Cut in the meted butter to make the crumb topping. In a mixing bowl combine all of the ingredients except the melted butter. Stir to combine and mixed well. Slowly drizzle in the melted butter a little at a time gently cutting in/mixing in with a butter knife. Do this until small gravel like crumbs starts to develop. Add and mix, in stages, until all the butter is in and you have a bowl full of the sweet crumb. Set aside. A beautiful crumb cake as is! Preheat the oven to 350 degrees, and line an 8”x11” cake pan with parchment paper, so the tender cake may be lifted out of the pan if need be. You may also just use a baking spray. In a mixing bowl cream together the butter and sugar until fluffy. Add the eggs one at a time mixing in thoroughly before adding the next egg. Add in the vanilla and mix. Scrape down your bowl. In a separate bowl combine the flour, baking powder, baking soda, and Kosher salt. Mix to combine. Measure out your milk in a liquid measuring cup, and the sour cream as well, separately. Combine the two and mix together. Add a portion of the dry mixture to the butter and sugar and mix in just enough to combine. The idea is to not over mix to keep the cake light and fluffy. Add the milk/sour cream in a small batch, mixing to combine again. Continue doing this with the dry mixture and the milk mixture until it is all in. Scrape your bowl down and give it one final mix. Spoon the cake batter into your prepared pan. Smooth evenly giving your cake one smooth surface. Top the cake with all of the crumb mixtures evenly. Place into the oven and bake approximately 45 minutes. Remove the cake and allow it to cool in the pan. Remove the cake from the pan if desired. Dust with powdered sugar or serve with my Blackberry Orange sauce. In a saucepan add the berries, sugar, orange zest, star anise, and water. Gently cook down until the berries are soft enough to mash. Mash the berries with a potato masher. Pour through a handheld strainer reserving the juice. Discard the pulp and seeds, then Pour the liquid back into the saucepan. Next, Make a slurry with the cornstarch and orange juice. Once the liquid comes to a simmer, pour in the cornstarch slurry and simmer until the sauce has thickened. Set aside to cool or drizzle the warms berry sauce over the crumb cake.